Learn Handball and Bjarte Myrhol believe that the most important we can give our kids is good Coaches to secure they experience to master the game, joy and well-being at the Handball court. Give all kids (6 - 16 år) equal opportunity to experience success and joy on the Handball court! After playing many years at the highest level I have created a huge network within Handball. A network that I have used to collect exercises and advices on training from some of the best Coaches and players in the world. This has lead to training programs that are of high quality, exciting and innovative all spiced up with a dash of joy, fun and playing. On a weekly basis Right to Play train more than one million kids around the world. Handball has been chosen as one of their focus areas. 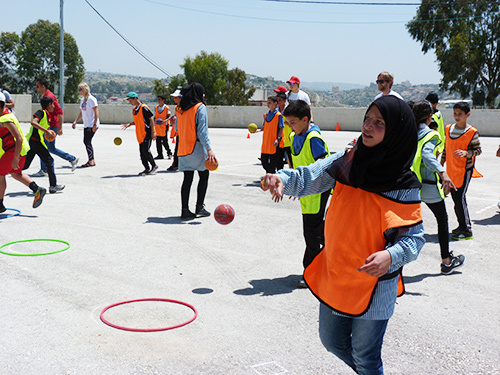 When Right to Play use our training programs we strive to give kids in poor and less fortunate areas in the world a better place to be through playing and having fun with Handball. We praise the job Right to Play does to make the world a little better place to be for the kids of the world.